The dead of Iraq and Afghanistan were a ghostly and somewhat startling presence in Madison Tuesday. To the sound of drumbeats, antiwar demonstrators circled the Capitol Square, in an event sponsored by the Wisconsin Network for Peace and Justice . 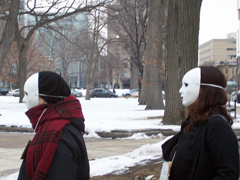 Many of the 150 or so participants in this "March of the Dead" wore white death masks and dressed in black, while carrying placards bearing the names of American and civilian casualties from the wars in Iraq and Afghanistan. They delivered petitions to the offices of Senator Herb Kohl and Representative Tammy Baldwin, calling for an end to wars in Iraq and Afghanistan. Many were also looking for an end to U.S. arms shipments to Israel, where military violence in Gaza continues to claim civilian casualties.